Orange bloom with a reddish-purple flame and ruffled edges. Mid season flowering, 40cm. Parrot tulips are known for their striking colours and ruffled petals. Parrot tulips are very unique and are always in demand. 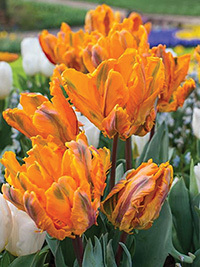 Parrot tulips are slightly more delicate than other tulip varieties and need to be planted in a spot where they will be protected from strong winds.